My Mom brought me to buy this game. i bought it with my own money, by picking up coins on the floor and saving it of course! I don't have a job! I am only a student and a 5 yrs. old. of course i am not writing this one either duh! well, I can type but it will take me probably a hundred years before I can finish this. My mom is helping me :) anyway, My mom didn't like this game because she can't pass through the 1st stage! I finished the games without using the walkthrough that mom my downloaded in the internet! lol! She just posted this so I have something in my blog tsk.. tsk.. anyway, bear with me! thank you for coming here and come back soon! 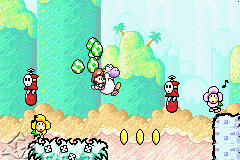 Yoshi's Island has every aspect from its original version from the SNES plus more. From the frustrating enemies to familiar tunes, Yoshi's Island is arguably the best port of any game ever. Despite the handicap of 2 buttons (the X and Y buttons), players will easily adapt to the GBA's controls without much problem. Our guide will help you get through the tough spots, find Red Coins, and generally succeed on the Island. Read on! Left and right - Moves Yoshi. Up - When applicable, enter doors. 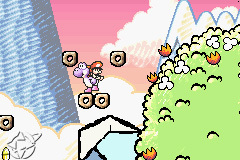 When no doors are present, Yoshi will look up, revealing what's above. Down - Duck and when applicable, enter pipes. When you're in the air, this will exectute a ground pound. Also, this will create an egg when you have a digestible enemy. Up + A - Used only when you enter an overhead pipe. Start - Pauses the game and view the menu. Select - View the status screen. L Button - "Locks" the cursor when aiming with your eggs. R Button - Press this once to activate the aiming cursor. Press down to deactivate. Patient Style: Press the R button again to throw an egg. Haste Style: Release the R button to throw an egg. A Button - Jump. In order to float briefly, press it again. 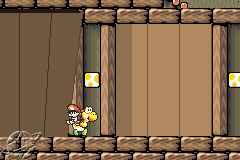 Note: If Yoshi cannot eat an enemy, try stepping or throwing an egg at them. Message Blocks - Hit these blocks for advice. "!" Switches - Step on these switches to reveal hidden objects. "?" Cloud - These are the equivalent of the "?" blocks in the original Super Mario Brothers. Hit them with an egg for their prize. If you find secret "?" clouds, you'll of course find better prizes. Pipes - Green pipes that allow Yoshi to enter into another area. Key - A big, fat key to open up a locked door. Normal Watermelon - A green watermelon will enable you to shoot out the seeds for awhile. Press the B button to spit it out. Fire Watermelon - A red watermelon indicates that it will make Yoshi spew out 3 blasts of fire. Ice Watermelon - A blue watermelon that chills out opponents. It also has 3 shots. Red Flower - This red flower will eat an enemy you throw in and will vomit out 10 stars for you. Middle Ring - The checkpoint of a stage. It also adds 10 stars to your timer. There are 4 different types of eggs Yoshi can throw. All eggs can ricochet off walls to hit other enemies or grab items, such as coins and flower Petals. Green - Normal eggs. Hit an enemy and they'll be flying away. Yellow - If it hits an enemy, this egg will spanw off some yellow coins. Red - Like the yellow, it will spawn off 2 small stars. Flashing - A red coin will spawn out once this egg hits an enemy. Like a Transformer, Yoshi can turn into a helicopter, submarine, mole tank, car, or train. Helicopter - Use the control pad to fly. Submarine - Press the A or B button to shoot the torpedo and use the control pad to manuever. Mole Tank - Use the control pad to dig through dirt. You can also dig upwards and downwards. Car - Use the control pad to move and press the A or B button to lift your body off from the ground. Train - Press the A or B button to dash. Once you hit a transformation bubble, you will have only a brief moment to get an item or progress through the stage. If you do not hit a big headed Yoshi block, Yoshi will fly back to where you grabbed the transformation bubble. If you do hit the big headed Yoshi block, you'll bring Mario to you and you can continue on your way. When you enter locked doors, a Mini-Battle will begin. If successful, you can win special items or 1-Ups. Throwing Balloons - A window at the top will appear, showing you the sequence of buttons you must mimic. Whoever holds the balloon when it bursts loses. Popping Balloons - Ground pound the balloons in order to find the star. Whoever finds it first wins. Spitting Watermelon Seeds - Eat the watermelons and spit them out at your foe. Whoever reaches zero life first loses. Gathering Coins - Collect as many coins as you can in order to win. At the end of each non-boss fighting stage, you will pass through a roulette. If it stops on a flower Petal, you'll get to play a mini-game. Scratch and Match - You have three chances to scratch off a 7 piece lotto ticket. If you score 3 Marios, you'll receive a 5-Up. If you score 2 Marios, you'll receive 2-Up, and one Mario will give you a 1-Up. The Slot Machine - Press the A button to stop the machine. If you match up three 7's in a room, you'll receive a 5-Up; three Yoshi eggs will earn you a 3-Up; three cherries will earn you a 2-Up. If you get a Shy Guy, Starman, and Watermelon in this order, you'll receive a 1-Up. Roulette - This is the only dangerous Mini-Game. First off, you place a certain bet of lives. You cannot bet your last life though. When you start it, you hope that you get more lives. If it lands on x0, you lose all your lives. Matching - This is the easiest one if you have a good memory. A set of cards will be revealed to you. Just take a quick glance and then the cards will flip over. Just match all the ones you remeYou have two screw-ups. Yellow Coins - Like all Mario games, collect 100 of these to earn a 1-Up. Red Coins - Each stage hides 20 red coins, disguised as yellow coins. In order to obtain a full score for each level, collecting all 20 of these coins is essential. Flower Petals - Like the red coins, 5 are located throughout each level. Collect all 5 of them for a 1-Up. The more of these you collect, the better your chances are for having a mini-game. Stars - These smalls stars add up more seconds for your countdown timer. You can reach a maximum of 30. Most of the time, they come out in a group of five and spread out quickly, so pick them all up. Starman - Once picked up, Baby Mario will be invincible, killing anything it plows through. It doesn't last very long so look out for safe spots when you're about to run out. The items you get from the mini-games are extremely useful when you want to get that 100 point score for each level. 10 Point Star - Increases your countdown timer by 10 seconds. 20 Point Star - Same thing as the 10 point star, but 20 seconds. "?" Cloud - Change all enemies into a "?" Cloud. Magniflying Glass - Enables you to see all the red coins are in the stage. Yoshi Egg - Gives Yoshi the maximum amount of eggs (six). Watermelons - According to the color, you get either a fire blast, ice blast, or seed blast. POW Block - Turns all enemies on screen into stars. Note: You cannot use items in boss fights. There are a lot of enemies in this game. In order to not confuse you, I'll just list the basic ones and describe the rest over the course of the guide. Shy Guys - This basic creature has 2 black eyes, a mouth, and is really short and stubby. Koopas - Turtles with shells. You cannot turn the shell into an egg. Piranha Plant - Knock out with your eggs. Boos - These ghosts will come after you when your back is turned to them. Take 'em out by rebounding an egg at the wall. Lakitu - The guy in the cloud that hurls "stuff" at Yoshi. Eat his cloud or himself in order to get rid of the pest. Monkeys - These guys are extremely annoying. They jump around a lot and throw bombs at you when they're up in the trees, and also shoot seeds at you with their watermelons. Evil Flower PETAL - These look similar to the flower PETALs you get in the game. They are extremely angry and will run you down. walkthrough... will post next time! what a dork! hehehe school time again:) Your game boy is MINE!!! !